These unique spoon rests consist of woven strips of glass that are fired several times to get the unique interwoven design. Embellishments of complimentary beads are added to add the final touch. The key holders are designed to hold 3 to 5 keys. Each has a design unlike any others. They are designed to be hung from the wall. 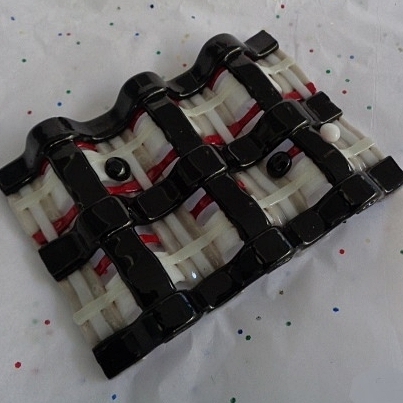 This unique design measures 3 " x 6"
This design consist of five layers of interwoven strips of glass. The final touch are 3 beads designed in my studio . The sturdy design will compliment any chef's kitchen. Please contact me at kp.forney@gmail.com with any questions. This design is available in a variety of colors. A Picasso inspired spoon rest like no other ! Any spoon would be delighted to nestle on this rest . Not only functional it is sturdy and measures approximately 11 “ long by 5” wide.